Meet the many of the smallest, newest, and best literary presses, magazines, and producers in the Northwest. This one-day offsite event showcases the many presses that don’t have the staff or means to be at the longer AWP three-day book fair. The Cleaners is conveniently located a block from Powell’s Books, Inc., in the Ace Hotel Portland. 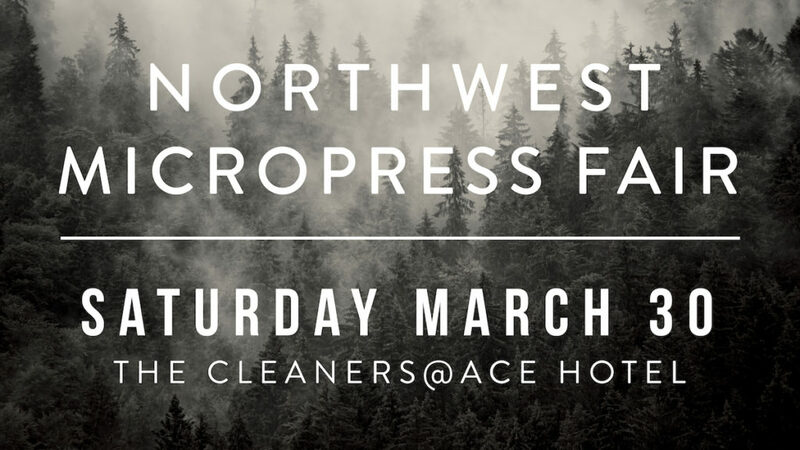 You could have the most EPIC day of book buying: AWP, which will be open to the public on Saturday, Powell’s, our press fair, and the NoFair/Fair event as well. https://nofairfair.com. BUY BOOKS! Presses and producers include: Entre Ríos Books, Scablands Books, Chin Music Press, Page Boy Magazine, Sage Hill Press, SPLAB, Short Run Seattle, Blue Cactus Press, Frontera Magazine, Margin Shift Reading Series, Cadence Video Poetry Festival / Northwest Film Forum, Till Writers, Ravenna Press, StringTown Press, Papeachu Press, Rhododo Press, Coast | No Coast, Winter Texts, Crab Creek Review, Poetic Games, Not a Pipe Publishing, Cascadia Rising Review, The Conium Review, Arq Press, Overcup Press, and Floating Bridge Press.